I am attempting to load a chrome browser with selenium using my existing account and settings from my profile. I can get this working using ChromeOptions to set the userdatadir and profile directory. This loads the browser with my profile like i want, but the browser then hangs for 60 seconds and times out without advancing through any more of the automation. If I don't use the user data dir and profile settings, it works fine but doesn't use my profile. The reading I've done points to not being able to have more than one browser open at a time with the same profile so I made sure nothing was open while I ran the program. It still hangs for 60 seconds even without another browser open. It always hangs on the GoToUrl. I'm not sure what else to try. So the Default Chrome Profile may not be in compliance with you Test Specification and may raise exception while loading. Hence you should always use a customized Chrome Profile as below. Open Chrome browser, click on the Side Menu and click on Settings on which the url chrome://settings/ opens up. In People section, click on Manage other people on which a popup comes up. Click on ADD PERSON, provide the person name, select an icon, keep the item Create a desktop shortcut for this user checked and click on ADD button. Your new profile gets created. 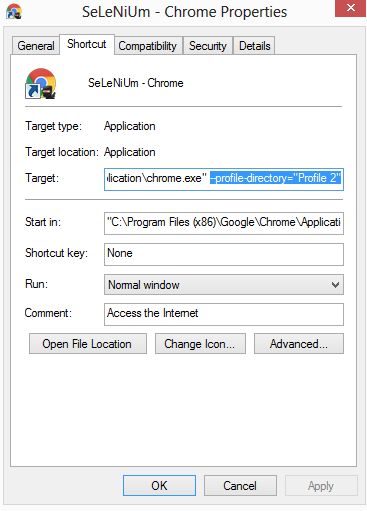 From the properties of the desktop icon SeLeNiUm - Chrome get the name of the profile directory. e.g. --profile-directory="Profile 2"
Not the answer you're looking for? Browse other questions tagged c# google-chrome selenium selenium-webdriver selenium-chromedriver or ask your own question. 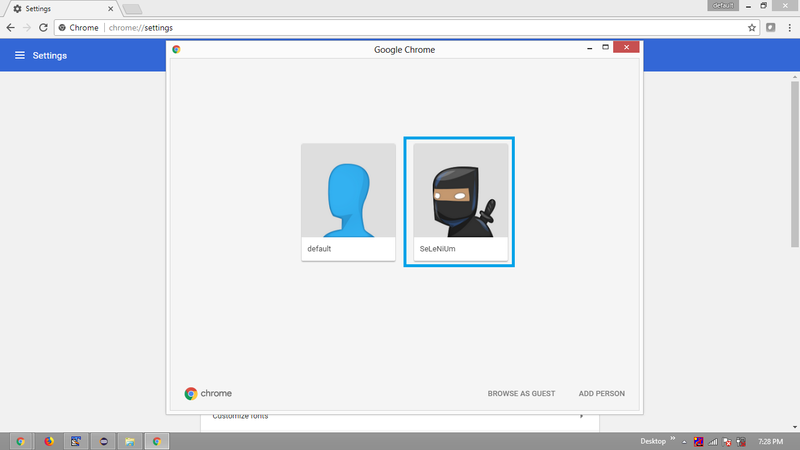 How can I share my current Chrome profile with Selenium?